I'm a third year graduate student in the Linguistics department at the University of Maryland, College Park where I'm also part of the Language Science Center. Broadly, I'm interested in meaning, its acquisition, and the relationship between linguistic and conceptual structure. I'm advised by Jeff Lidz and Paul Pietroski. Sigwan Thivierge, Mina Hirzel, Anouk Dieuleveut, Aaron Doliana, and Rodrigo Ranero. First- & Second-order Quantifiers: The meaning of sentences like every circle is blue can be captured in terms of individuals and their properties (e.g., for each thing that’s a circle, it’s blue) or in terms of relations between groups (e.g., the blue things include the circles). But does this formal distinction between first- and second-order logic correspond to a genuine psychological distinction in the mind of speakers? One way Jeff Lidz, Paul Pietroski, Justin Halberda, and I have been looking for evidence is by asking how well people remember fundamentally group properties -- e.g., approximate cardinality, center of mass, average size -- after evaluating quantificational statements. If a statement with a second-order quantifier promotes representing groups, participants should show better memory for these group properties than they do after evaluating a statement with a first-order quantifier. Here's our latest progress report. More & Most: Relatedly, we've been looking at how the meanings of more and most bias different visual search and memory encoding strategies. 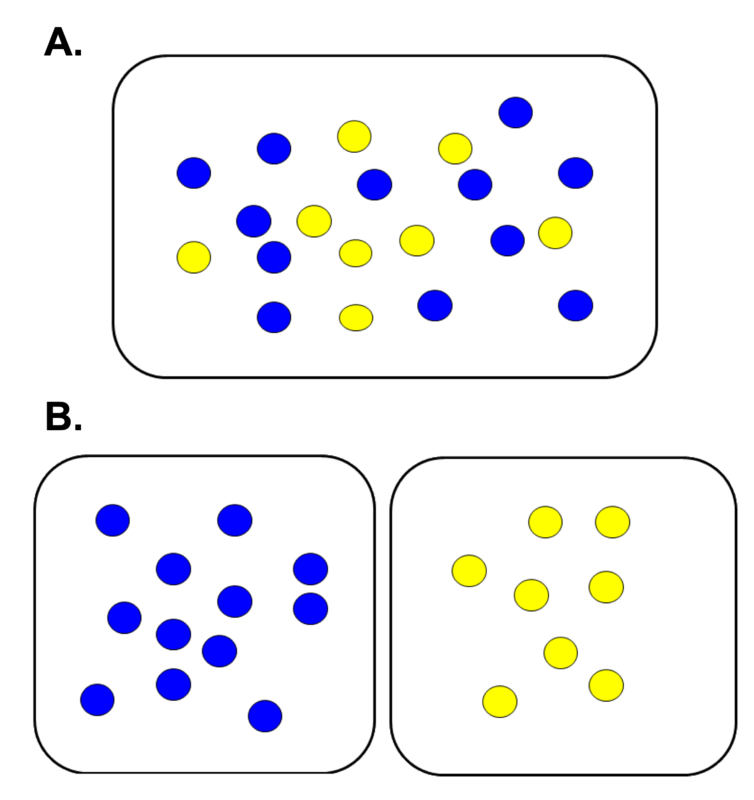 For example, when evaluating statements like more of the dots are blue, adults and kids represent the focused (blue) and non-focused (non-blue) sets and perform a direct comparison. 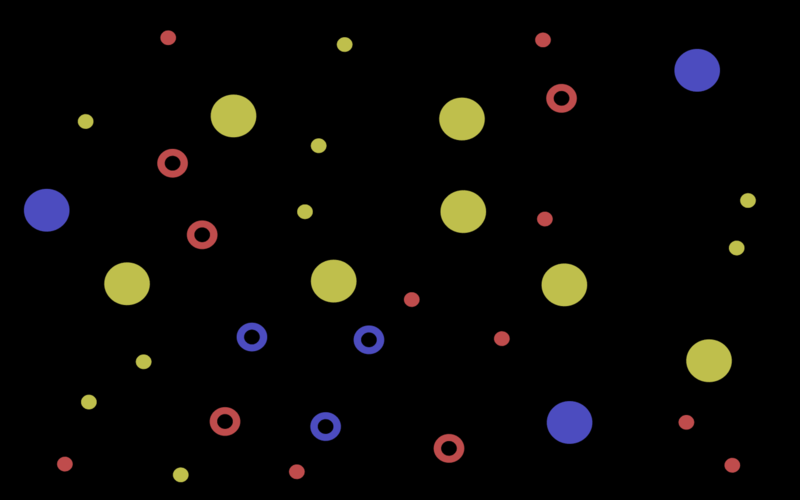 When evaluating statements like most of the dots are blue, on the other hand, people attend to and represent the focused set (blue dots) and the superset (dots) and perform a proportional comparison. In displays with only two colors, this is a sub-optimal strategy since it introduces more noise into the number estimates than the simple direct comparison would. With Yu'an Yang and Athena Wong, we've begun to extend these predictions to Cantonese quantifiers as well. Besides offering evidence for specific specifications of majority quantifiers, one upshot of this work is that meaning carries some detectible weight in determining which verification strategy gets used -- people don't always take the cognitively or perceptually easiest route. Event Concepts & Syntactic Bootstrapping: I'm also working with Laurel Perkins, Mina Hirzel, Alexander Williams, and Jeff Lidz to understand how learners relate syntactic arguments and event participants in verb learning. Do they expect the number of participants perceived in an event to match one-to-one the number of arguments in the clause describing that event? Or do they exploit knowledge of more sophisticated relationships and expect that particular argument positions will name certain participant roles? 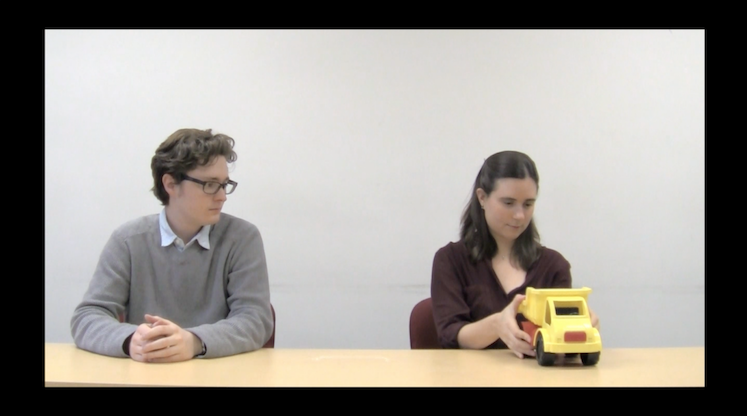 To this end, we’ve identified events -- like a girl taking a truck from a boy -- that infants plausibly view under a 3-participant concept but that adults often describe with transitive clauses like "The girl took the truck". We’re using these videos to test how young learners' hypotheses about novel verb meanings change depending on what syntactic frame they’re presented in. Pre-UMD: Before coming to Maryland I studied Cognitive Science at Johns Hopkins. I managed Justin Halberda's Vision lab and worked with him on a number of projects, many of which were related to the Approximate Number System. I was also fortunate enough to work with Akira Omaki and Emily Atkinson on a project investigating the relationship between working memory and parsing. T. Knowlton, P. Pietroski, J. Halberda, and J. Lidz (2019) The mental representation of universal quantifiers: evidence from verification. 32nd CUNY Conference, CU Boulder. T. Knowlton, J. Halberda, P. Pietroski, and J. Lidz (2018) Acquiring the universal quantifiers: every part together or each part on its own? BUCLD 43, Boston, MA. T. Knowlton (2018) Are natural language quantifiers first- or second-order? McDonnell Network Focused Workshop on “The Development of Set and Quantifier Representations”, Johns Hopkins. T. Knowlton, J. Halberda, P. Pietroski, and J. Lidz (2019) A novel memory task reveals early understanding of quantifier meanings. SRCD Biennial Meeting, Baltimore, MD. T. Knowlton, P. Pietroski, J. Halberda, and J. Lidz (2019) Representational format and universal quantifiers. LSA Annual Meeting, New York, NY. L. Perkins, T. Knowlton, A. Williams, and J. Lidz (2018) Matching number vs. linking roles: Using 3-participant scene percepts to understand infants’ bootstrapping. BUCLD 43, Boston, MA. T. Knowlton, L. Perkins, A. Williams, and J. Lidz (2018) Getting a grip on infants’ event representations: participant number in TAKE and PICK-UP. XXI ICIS Biennial Meeting, Philadelphia, PA.
T. Knowlton, A. Wong, J. Halberda, P. Pietroski, and J. Lidz (2018) Different determiners, different algorithms: Two majority quantifiers in Cantonese bias distinct verification strategies. 31st CUNY Conference, UC Davis. T. Knowlton, J. Halberda, P. Pietroski, and J. Lidz (2017) Sentences, centers, and sets: Set selection and the meanings of more and most. CDS 10th Biennial Meeting, Portland, OR. T. Knowlton, J. Halberda, P. Pietroski, and J. Lidz (2017) Distinguishing first- from second-order specifications of each, every, and all. The Seventh MACSIM, Georgetown. T. Knowlton, J. Halberda, P. Pietroski, and J. Lidz (2017) Set selection and storage reflect differences in quantifier meanings. McDonnell Network Plenary Workshop on “The Ontogenetic Origins of Combinatorial Thought”, UCSD. L. Perkins, T. Knowlton, M. Hirzel, R. Dudley, A. Williams, and J. Lidz (2017) Linguistic and conceptual structure in verb learning. McDonnell Network Plenary Workshop on “The Ontogenetic Origins of Combinatorial Thought”, UCSD.